Greek yogurt, fresh herbs, and einkorn make this a simultaneously refreshing and hearty salad! In a medium pot with a lid, toast the Einka & Lentil blend over medium high heat for about 5 minutes, until it begins to pop and smell toasty. Add 2 Cups water and a pinch of salt and bring to a boil. Then lower the heat to simmer, cover and cook for 25 minutes, until done. Drain off any excess water. While Einka & Lentils are cooking, prepare the dressing: In a small bowl or measuring cup with a spout, mix together the yogurt, mayonnaise, ginger and garlic. Zest the lemon into the dressing using a microplane grater or by removing the yellow zest with a knife and chopping it finely. Squeeze 2 teaspoons of lemon juice into the dressing. Add ½ teaspoon salt and mix well. To serve: Toss together the warm Einka & Lentils, chopped radish and fresh herbs, and ½ cup of the dressing. Taste and adjust flavors with additional salt, pepper, or lemon juice to your taste. 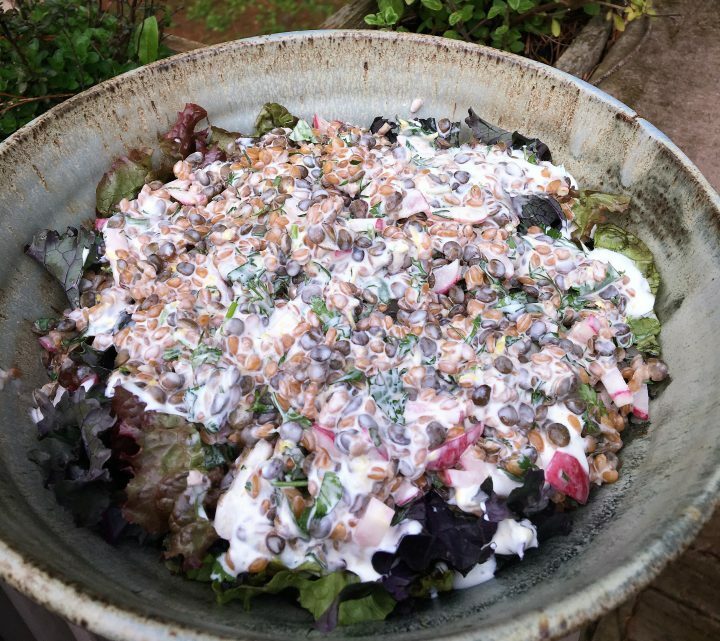 Place leafy greens into a serving dish and spoon the warm Einka & Lentil salad over the top. Serve with additional dressing on the side, for each person to drizzle on if they’d like more. Extra dressing and extra salad can be stored in the refrigerator for up to 5 days. The dressing is also great with any cooked or raw veggies, meats, eggs, or even on a sandwich instead of mayo!